The Twins AAA team calls themselves the "Beavers". Lots of joking around in this set. Kurt Kepshire was better known as a Cardinals pitcher. Making a funny face here. Ray Soff was better known as a Cardinals pitcher. Here he poses as a batter. Lee Tunnell was better known as a Cardinals pitcher. Here he poses as a batter. Kelvin Torve never pitched for the Cardinals, or at all, yet he poses like a pitcher here. Greg Olson poses with a bat, as he is a batter, but he's batting cross-handed here. 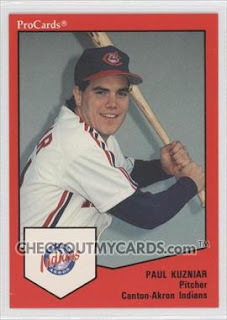 Paul Kuzniar pitched four seasons in the Indians and Red Sox organizations, going 17-15 with 18 saves and a 2.28 ERA. He kindly shared with me some great baseball card stories. "Albert Belle was my roomate for three years! On one card of mine with the Indians I was squatting down like a catcher! I was actually shooting the "the bird" - the middle finger - to Joey Belle at the time of the photo! As you will see in my baseball card they airbrushed my finger! THAT WAS ONE OF MY CLASSIC MOMENTS! Also in my Canton card! They would not let pitchers use a bat in their cards because of the DH! As you can see I snuck in at the end, grabbed a bat and took my card picture! The funniest part about the card is that I hit right handed but took the pic left handed to really piss them off! LOL! i had to pay a small fine! It was worth it!" Thanks! I don't have either of those cards, but here is one I do have from 1989 Best. The Tucson Toros were the Astros AAA team. The shots in this set are fairly generic and are poorly lit but the photographer did a good job of getting personality out of some of his subjects. Steve Lombardozzi sports the "untucked" look. His son now plays for the Washington Nationals. Hatless Jose looks like he wants to beat somebody up. Charley Kerfeld looks like a fat mess, which is actually how he liked to portray himself. He was once caught eating ribs in the bullpen and once had a contract that paid him $110,037.37 plus 37 boxes of Orange Jell-O. He was well known in the late eighties but is largely forgotten today. Ron Washington is now the manager of the Texas Rangers. One of the great baseball names, probably the only one with the letters "jstrl" in a row. It's always weird to see a minor league team whose uniforms look nothing like those of the parent club. A Dodgers team should never wear red uniforms. The best card by far in this set is of the team's trainer, Travis Junior from Reno 911. Here is the first of 24 posts on AAA teams in the 1989 ProCards set. I already showed the Cubs and don't have the Padres set (though I do have the infamous Keith Comstock card). This set features the Brewers' team in Denver, with some nice shots of Mile High Stadium, though every shot is from the same angle which makes it a bit monotonous. Greg Vaughn was the big star in this set and at the time one of the most-hyped prospects in baseball. You used to constantly hear about Greg Vaughn and Todd Zeile in 1989. Both went on to very solid, if not Hall-of-Fame-worthy careers. Kiki Diaz is known by his given name, Edgar, on several major league cards. One theme you will see repeated in these sets are guys showing up on minor league cards years after their last major league card. You will generally only see this on AAA level sets, which is why I like them the best - you get players on the way down as well as on the way up. You last saw Donnie Scott three years earlier on a 1986 Topps card with the Mariners. Joe Xavier was the closest yet we have come to having a major leaguer with a last name starting with X. Got some cool cards from Chad from Illinois (he doesn't have a blog). He knocked a bunch of cards off my wantlists (in fact, thanks to Chad I'm now down to just one need for 2007 Topps - #554, the second of two Elizardo Ramirez cards in the set). Last of the 1990 ProCards sets. Randy Kotchman is the uncle of Indians first baseman Casey Kotchman. Casey's father, Tom Kotchman, managed his own brother that season. Tom is thirteen years older than his brother, Randy. Outfielder Trenidad Hubbard played ten seasons in the major leagues for nine different teams, hitting .257 with 16 HR, 72 RBI and 33 SB. Now the CEO of Game Face Sports Int'l, an apparel company, he kindly answered my questions about baseball cards. "Remember, Hector V with the '89 Iowa Cubs was a right handed hitter. He posed as a lefty. 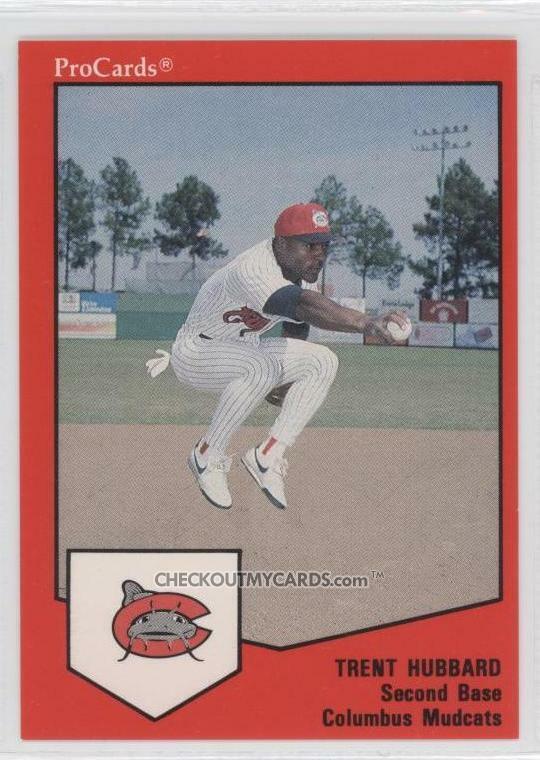 My favorite minor league card is a AA card from the Columbus Mudcats, 1989 or '90. I was jumping in the air, turning a double play, however the ball was still in my hand. Pretty cool and pretty funny. I do like your blog. A really good idea. I do collect cards, mainly my own." Thanks! I don't have that card, but here is one I do have, from the 1987 Asheville Tourists. Ehire Adrianza has been a shortstop in the Giants organization since 2008, mostly known for his defense. In 2012 he played at AA Richmond, hitting .220 with 3 HR, 32 RBI and 16 SB. He kindly answered my questions about baseball cards. "My favorite card is from the Augusta Greenjackets in 2009. I collect only my baseball cards." Thanks! 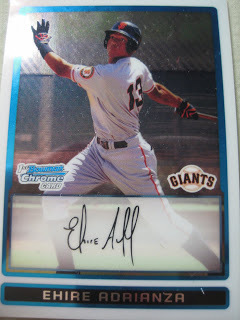 I don't have that card, but I do have this one from 2009 Bowman. This set may even be more plain than the last. This is the last of the really boring sets - they'll get better from here on out. This set is about as average as you can get in terms of player and photo selection. This card of catcher Buddy Micheu is by far the most interesting. Yuri Sanchez played in 1,215 games in fourteen seasons of professional baseball, mostly in the Tigers organization but with several other organizations in the US and Taiwan. Now the Owner of the North Shore Sharks Baseball Team in Wakefield, MA, he kindly answered my questions about baseball cards. "I have a friend, he never played pro but he always carried one of my cards in his wallet and he used to say he was my agent and it works, he used to get free lunches and dinners, funny stuff. I don't collect cards but I keep one of my good friends in the minors, and my favorite card of myself is the one where I'm turning a double play with the Tigers." 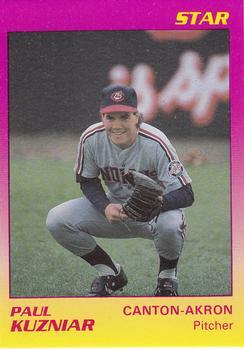 Catcher Greg Olson played five seasons for the Twins and Braves. He was a National League All Star in 1990. Now the General Manager of the Bearpath Golf & Country Club in Eden Prairie, MN, he kindly answered my questions about baseball cards. "My favorite card is the one where I am riding the Philly Phanatic's four wheeler. I took it for a ride, and boy was he pissed off. I do not actively collect baseball cards, but I have a box of them in my storage area that showed up in my spring training locker each year." Pretty simple set from ProCards, nothing really notable about the photos. Harrisburg was a Pirates minor league team. One big name in the set was Moises Alou, who made his major league debut for the Pirates in 1990, and was quickly traded to the Expos, where he became a star. "Spin and Mindy" sounds like it would be a good TV show. This set is brought to you by "The Hitting Machine" and WCMB 1460 AM. Harrisburg Senators games are still broadcast on 1460, but the station is now known as WTKT. 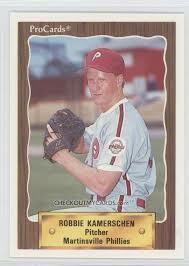 Robbie Kamerschen pitched in the Phillies organization in 1990, going 1-3 with a 5.33 ERA in 20 games. After the season, he became Deputy Press Secretary to US Senator Richard Shelby, and has gone on to a successful career in law and business, currently as the Chief Compliance Officer at Equifax. He kindly answered my questions about baseball cards. "I collected cards when I was younger—and my favorite card was a Hank Aaron card. I moved to Georgia just after he broke Babe Ruth’s home run record—so he seemed like the perfect player to pull for and idolize." The Tulsa Drillers were a Texas Rangers farm team. The design is very similar to the second half of the 1990 CMC set. Mike Taylor, pitcher with a bat (and a glove). Rosenthal is from Canarsie, Brooklyn. He went to the same high school as my wife (though a decade and a half earlier). These cards are brought to you by Tulsa's Baseball Card Store. Former Yankee Walt Williams shows why he was called "No Neck." I've already shown a few cards from this set recently. Here's the trainer, rocking the Reds sweater. At 22 years old, he was younger than most of the players. This set was brought to you by First Interstate Bank. I wonder how Harry Henderson IV felt when the movie Harry and the Hendersons came out. I also wonder if the is now a Harry Henderson V.
Lots of great photos in this set. Doug Dascenzo is one of those guys who always seemed to get good card photos. It's Yankees bullpen coach Mike Harkey! Yet another pitcher-with-a-bat card. Fun to see a junk-wax staple like Ed VandeBerg in an unfamiliar uniform.